Alaskan Malamutes require massive amounts of physical exercise. two requirements you have a high maintenance dog. Be prepared to get in shape! Your Malamute requires vigorous daily exercise. don't already have one, a sturdy mountian bike with good brakes. You can click the link below to visit Springer's site. the bike, or, pull it over! Unless your walks are 4 miles a day, they will not be sufficient for your dog. Please keep this in mind when deciding whether or not your lifestyle will agree with that of an Alaskan Malamute's. Make sure you do not run your dog if the it is over 70 degrees and take breaks. Also carry water on your bike, or in a back pack (on your back), for your dog. 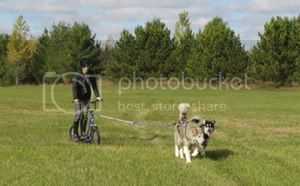 If you don't care much for bicycling, you may want to consider purchasing a Dirt Dawg Scooter and ski-jouring harness and teach your Malamute to pull you! 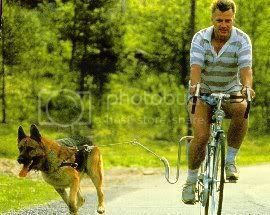 This can be a lot fun for you and your dog as well as provide the absolute best form of exercise. Dog scooters are ideal for one dog, or two very young dogs. A Springer or a Dog Scooter will ensure your dog stays at optimal health his whole life through. It will greatly reduces the risk of heart disease, joint degeneration and many other health problems Malamutes are prone to without proper exercise. and thin clean air. This is also a good, inexpensive, way to earn your dog a working title. training sessions to strengthen the bond between the two of you. hitting the book store shelves. 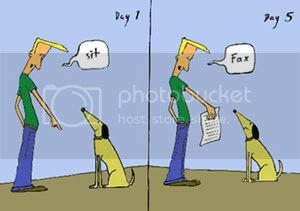 See "Basic Obedience" training link for tips. then you would expect. At the same time, be very careful NOT to over feed your Malamute! Do not free feed your Malamute. By Arctic insticnt, a Malamute will eat itself to death, or cause a condition called "Bloat", a quick & deadly illness. I've found that a good rule of thumb is around 1 cup per 20 lbs of body weight up until around the 80-85 lbs range, at which time dogs who exceed this weight seem to require nearly double. Many people tell me their standard sized male Alaskan Malamutes (85 lbs) eat 4 to 4 1/2 cups a day. Although my 100 lbs dogs require 7-8 cups a day, and my largest dog, who is now 150 lbs, eats 12 cups a day. I'm trying to give you the best idea I can because I have found it to be like pulling teeth on gathering information about just how much Alaskan Malamutes eat. It varies greatly!